Carter has two children. His daughter, Monterae works in philanthropy. 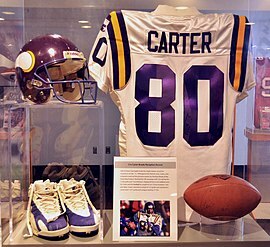 His son, Duron Carter, played wide receiver at Ohio State in 2009 and Coffeyville Community College in 2010. Professionally, he played for the Montreal Alouettes, a Canadian Football League (CFL) team, in 2013-2014 and 2016, spending 2015 on the practice squad of the Indianapolis Colts of the NFL. In Montreal, Duron was described as being a terrible teammate among the players on the Alouettes team. In 2017, he signed on with the Saskatchewan Roughriders, also in the CFL, where he served primarily as a receiver and occasionally played cornerback. Duron was released by the Roughriders in August 2018, in the midst of the 2018 CFL season. He subsequently signed on with the Toronto Argonauts a few weeks later. Cris is the younger brother of ex-NBA player and coach Butch Carter.